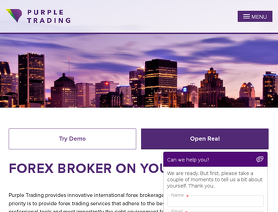 Purple-Trading is a forex broker. Purple-Trading offers the MetaTrader 4 forex trading top platform. Purple-Trading.com offers over 35 forex currency pairs, gold and silver for your personal investment and trading options. I think best execution between ECN brokers with EU regulation. I have very good experience. Their trade execution is really lighting fast!!! Their trade execution is really lighting fast!!! SUPER! Very nicely processed personal zone, where you have everything at your fingertips. Quality broker with excellent (super fast) execution of trading orders.